OAKLAND, Calif. (AP) Two All-Stars down, the Splash Brothers took charge. Stephen Curry and Klay Thompson showed some patience coach Steve Kerr appreciated. They made the perfect pass. They were efficient. They lit it up from all spots on the floor. ”Kind of back to who we are, moving the ball,” Curry proclaimed. 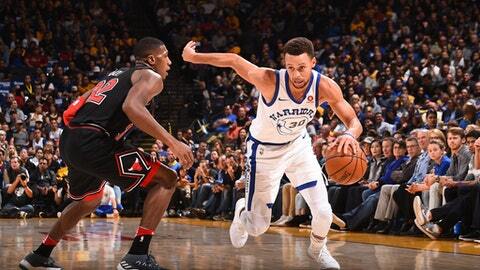 Curry found his stroke from way back and breezed past a 7-footer in the paint with authority, putting on a thrilling display with 33 points Friday to lead the Golden State Warriors over the Chicago Bulls 143-94 on a night Kevin Durant and Draymond Green were out. Curry and Thompson came to play with their fellow All-Stars out. NBA Finals MVP Durant was sidelined the second time in three games with a sprained left ankle, while Green didn’t play for rest. Two-time MVP Curry notched his seventh career 30-point half and 21st 20-point quarter, when he scored 26 in the second as the Warriors matched their biggest half of the season with a 74-53 lead at intermission. Steph was feeling it, all right, following up a deep 3 in the second quarter with a high-step shuffle and chest pat before waving his hands in the air for the crowd to join the fun. And with Green’s muscle flexing absent on this night, Curry drove left and over 7-foot Robin Lopez for a layup late in the second and was fouled. On the floor beneath the basket, he flexed his biceps in celebration. Curry shot 10 for 18 with four 3-pointers, while Thompson added 29 points on 12-of-17 shooting with five 3s. Big man Zaza Pachulia had a season-best 11 points and career-high six assists. Rookie Jordan Bell made his first career start and had a quick one-handed slam – this after being inactive in four of the past five games. Omri Casspi also started for short-handed Golden State coming off a 108-91 loss at Oklahoma City on Wednesday night. Scurrying back on defense, Bell made a pretty block from behind against a driving Denzel Valentine midway through the third and finished with six blocked shots in 26 minutes. Jerian Grant scored 21 points off the bench, Lauri Markkanen scored 14, and Valentine added 10 in the Bulls’ fourth straight defeat and ninth in 10 as Chicago concluded a winless four-game road swing out West. Pachulia stole the ball from Lopez and drove to the basket as Lopez took him down with 4:25 remaining in the third and Pachulia hit his head on the padded base of the basket. The play went to official review and Lopez received a Flagrant 1 foul. Both teams shot 54 percent in the first quarter, but the Bulls were outscored 45-21 in the second quarter as they went 8 for 25 from the floor. Bulls: Chicago is 2-10 in November. … The Bulls last won at Oracle Arena 113-111 in overtime on Jan. 27, 2015, snapping Golden State’s 19-game home winning streak. Warriors: Kerr plans to rest Green from time to time as he sees fit, and had made the decision about a week ago – then briefly reconsidered with Durant sidelined before sticking with the plan. ”It’s something I’m going to do periodically during the year. Last year during The Finals I thought there were games where Draymond, we were almost piecing him together,” Kerr said. ”Because of how hard he plays and because the nature of his game we just need to give him a rest once in a while. I planned this one a week ago.” … Bell played his most minutes, topping his previous best of 12. … Golden State is 5-0 after losses this season. … The Warriors are 8-2 against the Eastern Conference, 6-1 at home. … Two-way G Quinn Cook was back with Golden State from the G League and got a nice look in the blowout. After the Warriors took Thursday off following the road trip, Kerr was called into the training room Friday morning with the update about Durant’s status. ”He had some soreness in his ankle significant enough to keep him out,” Kerr said. Bulls: Host Miami on Sunday. Warriors: Host New Orleans looking for a ninth straight victory in the series and 10th in a row at home.